Usually when making sushi rolls, the sushi chef takes ready-made rice and approximates the amount needed, often making a big error in weight. Then the sushi chef spends about 30-60 seconds forming a rice mat on a piece of seaweed (sushi chefs with no experience — takes longer forming a rice mat), adds a stuffing, and wraps a roll. As a result, different sushi chefs make rolls of different shapes and weights, and have trouble managing orders on peak workload days (weekends, Christmas and others). 1) You can keep one sushi chef for cooking complicated dishes and employ less qualified and less expensive personnel for cooking popular sushi dishes. 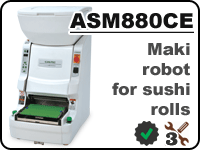 2) When you turn the robot on for the first time — you can adjust it under 5 different types of maki rolls and then always prepare rolls of the same size, shape, and weight. 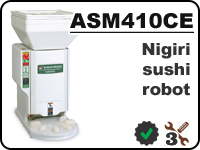 3) The robot spends about 5-12 seconds making one roll. You will always cope with orders on peak workload days and you will not lose your clients. 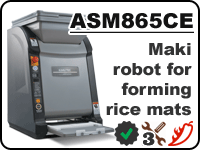 The most popular maki robot! and take away (sushi shop). 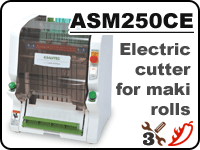 Before serving a client, it is necessary to cut the prepared roll into equal pieces (usually 6-8 pieces). Unlike the person, the robot always cuts the roll fast and equally. No more cuts on fingers. 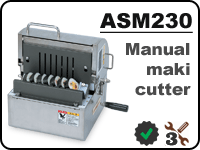 The most popular maki cutter! 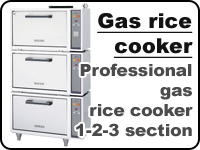 Ideal for sushi restaurants, catering. 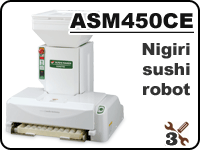 These compact robots can produce nigiri (sushi) rice balls of high quality, excellent shape, and perfect texture. They do not damage rice while compressing, unlike the majority of sushi chefs. 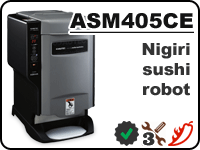 Robots always make nigiri of equal shape and weight. 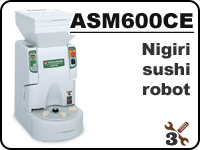 One professional nigiri robot can easily replace up to 10 sushi chefs because of its huge productivity. 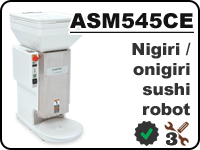 The most popular nigiri robot! or take away (sushi shop). Onigiri is a popular dish in Japan. Healthy and tasty food. Excellent alternative to fast food. You can always take packed Onigiri in your bag and have a bite anytime, anywhere. The next step after boiling the rice is to mix it with vinegar and additives (sometimes preservatives). At this step, we need to break up rice lumps to uniform mass and cool down to the suitable temperature for sushi chef's hands. 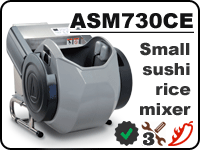 The sushi rice mixer combines all these steps with itself. 1) A person mixes rice unevenly, depending on their mood and usually there is badly mixed rice with some lumps on the sides of the tub. The mixer, on the contrary, always mixes rice evenly. 2) The cycle takes 3-4 minutes instead of 40-50 minutes. 3) The mixer can be used as a thermos. 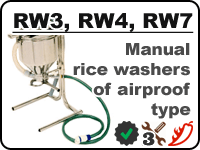 ♦ At the mixing step, it is possible to add preservatives to rice. Using the proper package and storage temperature — the sell-by date can be extended to 10 days without freezing. Upon purchase of the equipment, we can provide you technical support in this question and share the successful experiences of our clients. 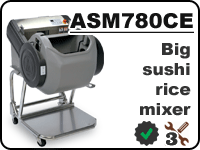 The most popular sushi rice mixer! Optimal for sushi restaurants, delivery and take away. big delivery and big production. Before rice cooking, it is always necessary to wash rice. 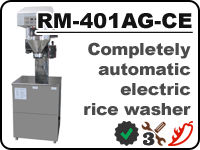 Rice washing is used to rinse away natural starch. A person can do it badly or well but as a result, the process can be long and depend on the mood of the chef. 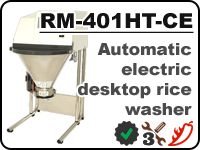 Rice washer always rinses away the starch until the water becomes absolutely clear. 1) You can save on the cost of rice by buying cheaper rice varieties with higher starch content. 2) After complete washout by rice washer – rice doesn't burn in a rice cooker and you save on the cost of the damaged burnt rice. 3) You obtain stable quality and taste of rice in ready sushi. Sushi consists of 70-80% rice. restaurants, delivery and take away. 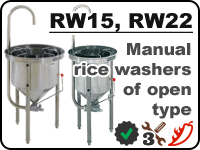 rice washer in the world! production, delivery or take away. 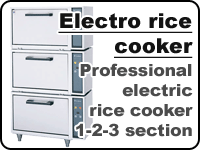 Cooks rice suitable for sushi molding and helps to prevent waste of rice because of human error while cooking rice. You can constantly save on using natural gas instead of electricity. It is much cheaper in the long term. Rice bowl is isolated from the ambient air while cooking. Inside there is slightly higher pressure steam to provide a solid layer of the polymerized gluten. 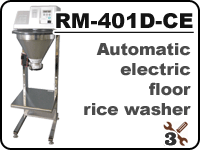 This surface prevents excessive glutinosity of ready rice. Cooking of any type of rice. Cooking time – about 15 minutes, full cycle – 30-50 minutes.